Every year, I look forward to the holidays. I enjoy the baking, food, decorations, music and getting together with friends and family. However, I hate addressing Christmas cards. It take hours upon hours. And if you mess up, you have to either use white-out (which looks horrible) or throw out the envelope, which means you're short one. 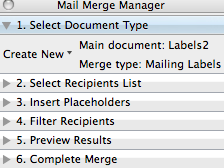 Honestly, I have better things to do with my time than spend an entire weekend dealing with filling out envelopes. About 8 years ago, I decided I was going to get smart about my Christmas cards, and let technology save me hours of my precious time. I was already saving my addresses in my address book on my computer, so the most time consuming part of this process was already done. If you're not saving your addresses on your computer, do it! You only have to do this once, and then update as people move, get married, etc. Here are my steps for addressing hundreds of cards in less than a half hour. I promise! 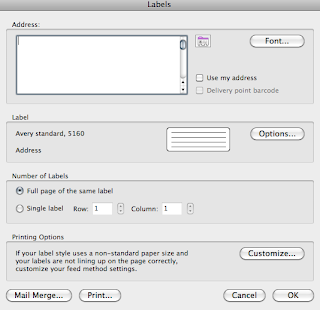 All you need is your computer, a printer and adhesive mailing labels of your choice (You can find them at Wal-Mart, Staples, etc. in a nice holiday pattern - you can get them in packs of about 150 or more) in a size of 2 5/8" x 1" (or 66 mm x 25 mm). **Disclosure, I did all of this on a Mac using Office 2008. If you have a PC or a different version of Office, your steps and how things look might be a little different than mine. But, this should give you general guidelines of how to get this done. If you haven't already done so, enter your addresses into the mail program on your computer (Entourage for Mac, Outlook for PC). This is the most time consuming step of this entire process (and not included in my half hour time estimate). 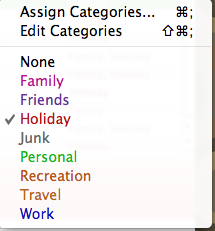 If an address not in your "Holiday" category, click where it says "None" for their listing under the "Categories" column and choose "Holiday" - this step is extremely important to make this process work. The hard part is done! Now, open Word on your computer. 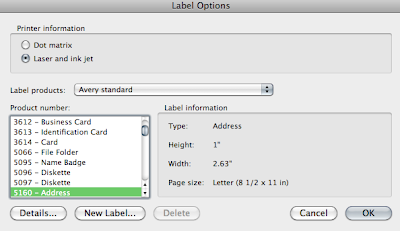 Scroll through the list of label options to find the size of the labels you'll be using. In my case, I have an 8.5 x 11 sheet of labels with 2 5/8" (aka 2.63") x 1" labels on it. 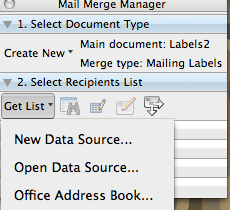 Highlight the appropriate label size and click OK.
You're back to the Labels screen. 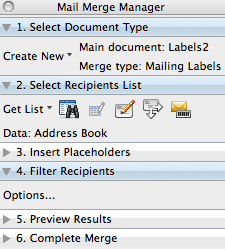 Click Mail Merge in the bottom right hand corner. 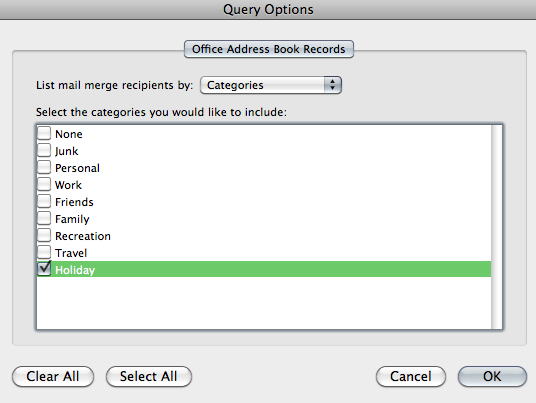 Expand option 2 (Select Recipients List) and click "Get List"
Once the Edit Labels box pops up, click Insert Merge Field. Choose Full Name. 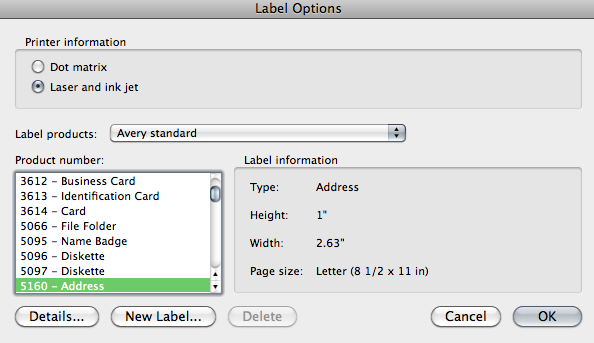 You will see it populate in the Sample label box. 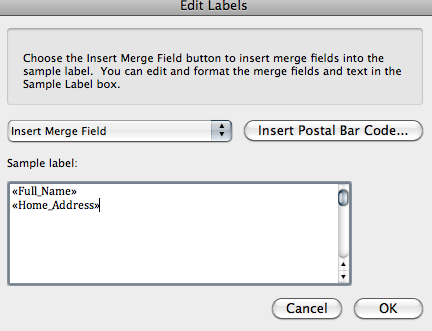 Hit Return/Enter after <<Full_Name>> and then click Insert Merge Field again. Chose Home Address this time. Then click OK.
From the Query Options box that pops up, choose "Holiday" (this is why it was important when you were entering addresses earlier to designate addresses in the Holiday category) and then click OK. 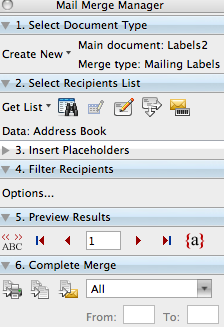 Select the middle icon (with two pieces of stacked paper), which is "Merge to New Document"
Like magic, a new document will open in Word, with all of your addresses for your holiday cards laid out in the format of your labels! Now, I like to do a test run to make sure I know which side is right up on my labels in my printer. Make a copy or two of your label sheet and do a test run (or two) of the first page to make sure everything is laid out the way you want. 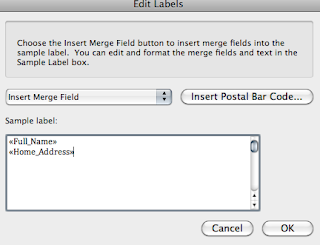 I normally format my labels so that all the addresses are centered in the label (by default, they'll be left justified). To do this, just select all the labels (Ctrl A on a PC or Command A on Mac and then choose the center justification from your formatting menu). Once you're happy with how they look, stick your label sheets in your paper tray and print! 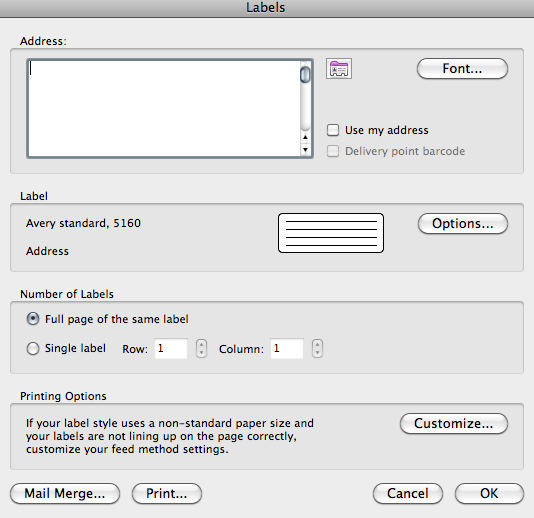 Once your labels are all printed, it will take mere minutes to put all the labels on your cards. Not only does it look neat and professional, but the colorful holiday labels add a little extra something to your cards. I've been trying to stay away from dairy over the last year. Some of my family has a dairy sensitivity, and sometimes I wonder if I do as well. I had enough Pecan Coconut Pie Crust mix leftover from when I made it two weeks ago to make another pie, so I decided to experiment by making a non-dairy pumpkin pie. I've seen a lot of pumpkin pie recipes that use tofu in place of eggs and milk. There's no way I'm adding anything with soy to a recipe, so I decided to try using coconut milk in place of condensed or evaporated milk, as you would normally see in a pumpkin pie. Beat together eggs, pumpkin and milk until frothy. Add in brown sugar, spices and salt and beat until well combined. Pour mixture into prepared pie crust, but make sure not to overfill. I also had enough of the pie mixture left over to fill two greased ramekins. Bake at 450 for 10 minutes, and then reduce heat to 350 and bake for 30 to 35 more minutes. The ramekins only need to bake for about 30 minutes total, so you can take those out of the oven before the pie. Let cool and either serve or refrigerate. After having success with the grain-free muffins, I decided to try making some grain-free bread. I was making some vegetable stew today out of many of the items from our CSA share, and I really wanted some bread to go with it. Not only is this a grain-free, gluten-free bread. It's also dairy-free and high in protein. It's easy to slice and tastes great when it's hot out of the oven. I didn't add in any chocolate chips, nuts or dried fruits, but I would imagine it would be good with 1/2 cup of your favorite add-ins. 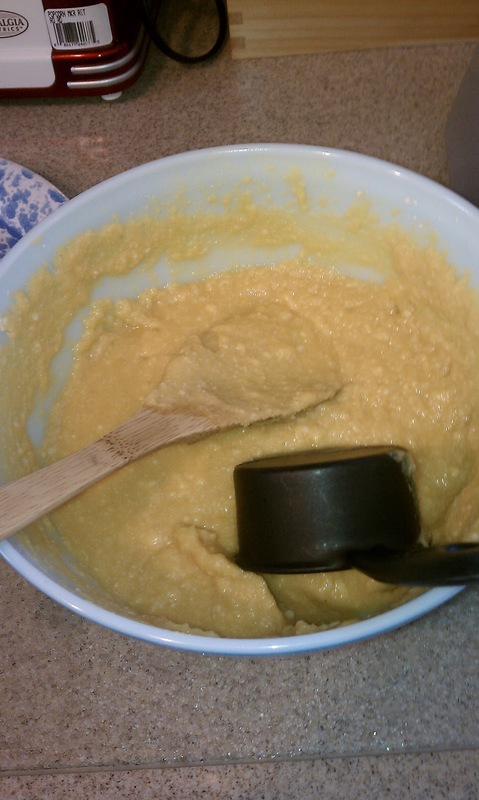 Using a stand mixer or with a handheld electric mixer, combine all ingredients except for lemon juice. Add lemon juice last and don’t overmix at that point. *Optional – at this point, fold in any dried fruit, nuts, chocolate, or other add-ins you would like. Grease a medium loaf pan with coconut oil and pour the batter in. Bake about 45 minutes or until a toothpick inserted near the center comes out clean. Let it cool for a few minutes, then slice and eat. As sad as I am about the end of summer, I look forward to the bounty of the autumn harvest. What I particularly like about fall vegetables is how functional they are. Not only can you store them for months without them rotting, they also make beautiful, colorful decorations for your home. I somehow ended up growing a large amount of Jack-be-Little gourds in my garden this year. This was completely by accident, as I've never purchased seeds for them before! I'm not sure how it happened, but they took over a large portion of my garden! By the end of the season, I must have had 30 gourds to harvest. I gave some to my mom, and I used the rest for decorations around my house. These free decorations will be in use until I put up all of my Christmas stuff! 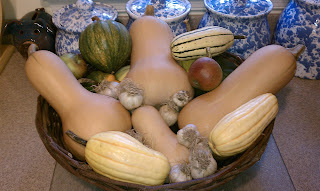 In addition to my gourds, I also have a lot of nice winter squash. I grew some, my mom grew some, and I get some each week from our CSA share. 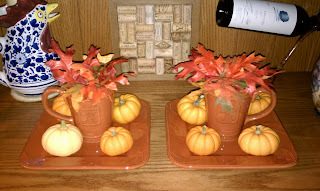 These squash also make nice center pieces, along with other functional harvest items, such as garlic, apples and the like. 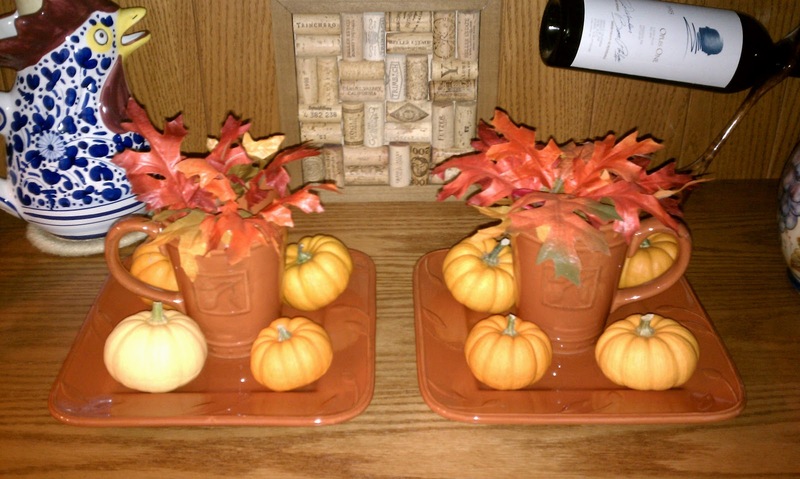 If you're lucky enough to have some squash or other fall harvest items in your house, show them off! Don't hide them from view. 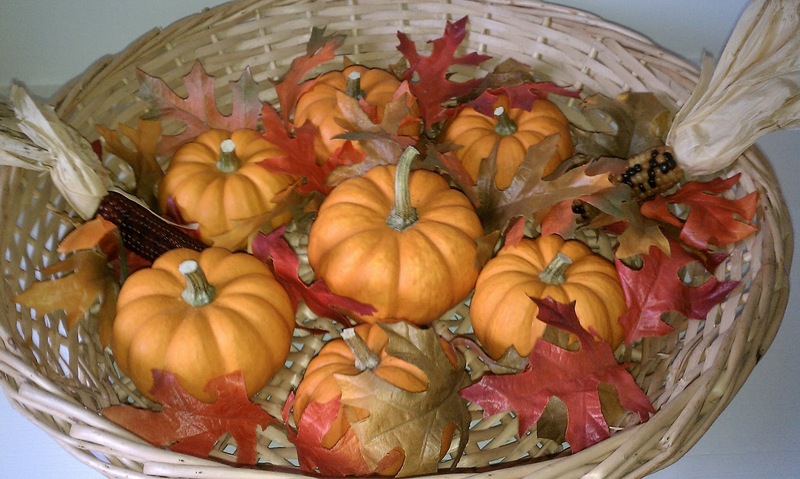 Enjoy the interesting shapes and colors all season by placing them in bowls or baskets and have them handy and nearby as you cook. As our fall party approached a few weeks ago, I wanted a new fall-themed recipe for the main dish. Something that used seasonal foods such as apples, squash and fall spices. I found a recipe online, and modified it with my own ingredients. I also changed it into a crock pot recipe, so I could throw everything together and let it cook throughout the afternoon. My husband was a bit suspicious about the ingredients ("Are people going to like this?! "), but it was well liked by everyone who tried it. It is definitely something I'd make again. Heat the oil in a large pot over medium heat; cook the chicken in the hot oil until it has begun to brown. Transfer to a large crock pot. Add the bay leaves, salt, thyme, cinnamon, black pepper, onion, turnip, garlic, celery, potatoes, carrots, squash, apples, chicken stock, apple cider, cider vinegar and parsley to the pot. There should be enough liquid to just cover the vegetables. If not, add more stock to cover the vegetables. Stir everything together, cover and cook on high heat for about 4 hours, or low heat for up to 8 hours. Remove the bay leaves and serve. *Note: I've also done this as a vegan version, by adding in a can of chickpeas instead of the chicken and using vegetable stock, and it was just as good. My poor waffle maker. It had been sitting in my pantry, collecting dust for the last year and a half. Between not being able to eat gluten, to trying to stay away from a grain-heavy diet, it had no use in my life. I missed waffles. They used to be one of my favorite things to make on weekends for special breakfasts. Recently, I came across a great recipe for waffles. It's grain-free, gluten-free, and high in protein. It's very tasty and you would have no idea it's mainly made out of eggs and coconut flour. It's delicious with maple syrup on top, and I would imagine it would be good with any sort of fruit topping as well. 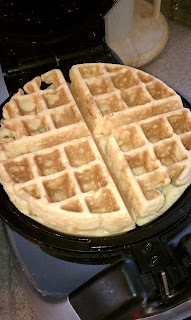 I made a quadruple batch of the recipe below, so it made 4 large Belgian waffles. Mix everything together, and let the ingredients sit for about 5 minutes while your waffle iron gets warm. You won't need any oil sprayed on the waffle iron with these. 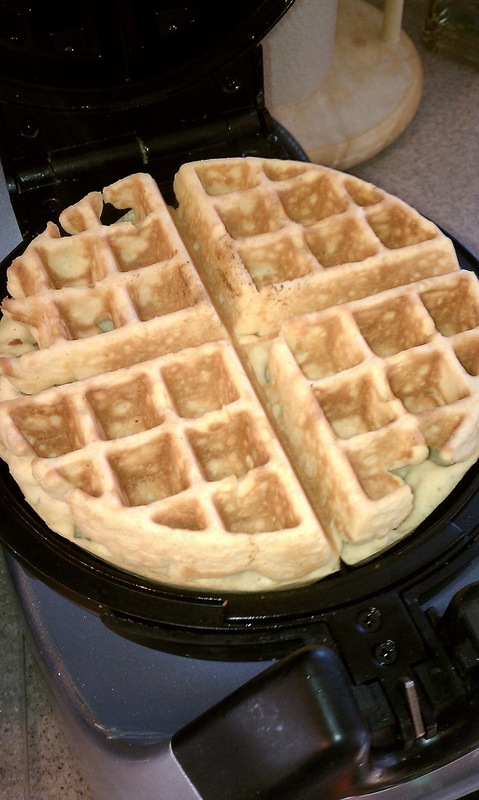 Pour batter into your waffle iron and barely cover the “hole” lumps of the waffle iron, as this batter expands a lot. Close the iron and wait several minutes, until the steam stops coming out quite as much. When the steam starts to subside and the waffles are starting to brown, remove them to a plate. Repeat until all of your batter is used up. Pumpkin pie is one of my favorite things to make in the fall. I love the smell of it while it's baking, and I love the taste of it when it's done! I always look forward to the arrival of autumn, so I can start baking pumpkin pies again. A few years ago, I started to modify my pumpkin pie recipe to make it with a graham cracker crust. If you've never tried it, I think it's much better than a traditional pastry crust. Now that I'm gluten free, I either need to buy GF graham crackers to make a crust (which can sometimes be difficult to find) or come up with another solution. 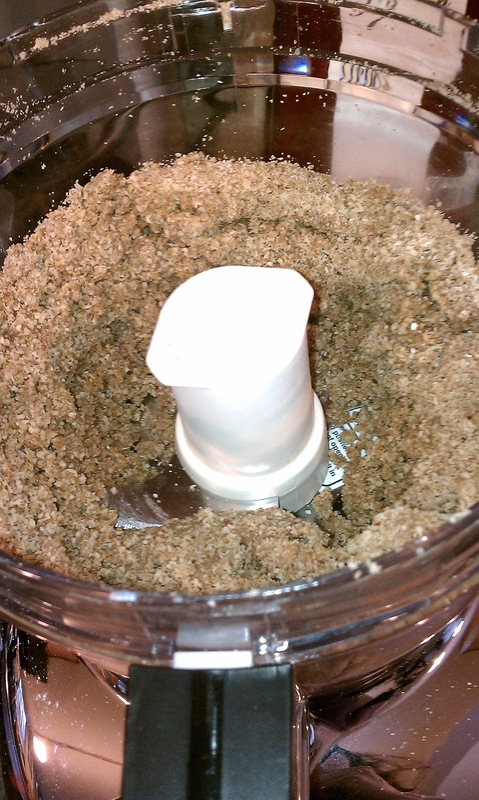 Put all the dry ingredients in a food processor and pulse until the mixture looks like coarse sand. Add in butter and pulse several times in short bursts until the crumbs are moist and begin to fall away from the sides of the bowl. Pour the crumbs into a 9-inch pie dish and spread them evenly. 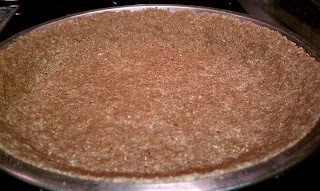 Using your fingers, gently press the crumbs across the bottom and up the sides, about 2/3 of the way up. Bake in the center of the oven for about 7 minutes to set. Add pie filling and bake as directed. 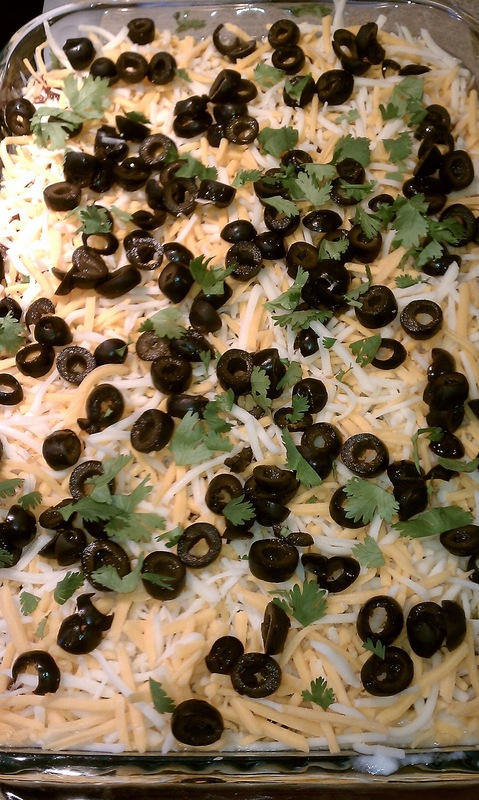 While preparing food for a party a few weeks ago, my husband suggested I make something other than the normal cheese and crackers or chips and salsa as snacks for when guests arrive. I looked around in the refrigerator, and realized I had a lot of the fixings to make some sort of mexican layer dip. I didn't really follow any recipe in particular, but it came out well and everyone really liked it! 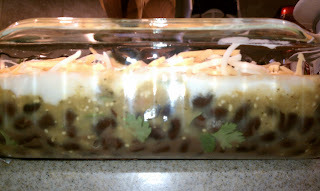 Drain beans and combined with chopped cilantro and lime juice in a 9x13 pan. Layer on salsa verde, yogurt, guac, salsa, cheese, olives and chopped cilantro. The measurements of each ingredient can be changed based on your preference or what you have available. This can be eaten immediately, or chilled and served later. This is great to dip with corn chips, or you can make yourself a nice mexican wrap with some of this on a soft corn tortilla.